Did Alan Kurdi's death change anything? It was the picture that moved millions of hearts. 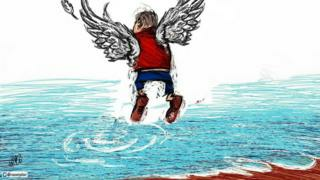 But a year on, did the image of Syrian toddler Alan Kurdi's drowned body bring about any real change? Exactly 12 months ago today, we witnessed what felt like a historic 12 hours on social media. Within that space of time, an image of a three-year-old Syrian boy from Kobane, whose dead body was found washed up on a Turkish beach, was seen by 20 million people around the world on social networks. Eleven other Syrians had died on the same boat journey - including Alan's four year old brother Ghalib and their mother Rehanna. But only one small body was photographed and posted and shared online. The viral trend propelled newspapers and broadcasters to publish the harrowing image too (we haven't reproduced it here, apart from in artistic representations). In all the frenzy and debate that followed, there was a sense that something had changed around the issue of Syrian refugees. That is certainly how the dead child's Aunt Tima - living far away in Canada - felt about it back then. "It was something about that picture," she told me afterwards. "God put the light on that picture to wake up the world." But would Alan Kurdi's death really prove to be a turning point? And should it have? On social media, the "Alan Kurdi effect" was palpable at the time - and has remained so, The hashtag 'Refugees Welcome' had in fact surged in the hours before he died, but the image drove it even further. It's still being used thousands of times a day, and at least 20 million times over the past year. A study from the University of Sheffield also noted a change in the language being used about Syrians entering Europe. The vexed debate, including at the BBC, about whether the word "migrant"' or "refugee" should be applied to Syrians, seemed to have shifted on social media - with the word "refugee" surging ahead in common use. "There is a shift in language that signals a shift in the sense of people's responsibility," argues Frank Duvell of Oxford University's Centre on Migration, Policy and Society. "Talking about refugees means acknowledging some responsibility for international protection which the word 'migrant' doesn't entail". With the change in language came the mobilisation of ordinary people - who saw the Alan Kurdi image and volunteered to help. "We saw, because of the rise of attention, also a rise in the mobilisation of people who started rushing to the scene to Turkish beaches, to Greek islands to the Balkan route," says Duvell. "Previously people would arrive on deserted beaches they would walk for hours day and night soaked in water to the nearest villages and suddenly there were volunteers on the beach helping them out of the boats helping them with dry clothing." Despite the evident rise in public concern over the past year, other statistics tell a darker story. Oxfam this week highlighted data that showed the total number of refugees and migrants who have died while trying to reach another country has increased by more than a fifth in the last year - from 4664 deaths in the year before Alan Kurdi's death to 5700 since. The vast majority are deaths on the Mediterranean. And while there's been a marked reduction in boat journeys from Turkey to Greece - spurred by the EU's deal with Turkey over Syrian resettlement - other boat journeys on the Mediterranean have continued in large numbers. Under the agreement those arriving in Greece are now expected to be sent back to Turkey if they do not apply for asylum or their claim is rejected. Syrians themselves were very aware of Alan Kurdi's death - but boarded boats anyway. "I don't know how to swim, so I was afraid," says Mohammad Arar, a 27 year old medic who was born and raised in Syria. "But this was better for me than to be in prison." Arar told us he fled the war in his country with the help of traffickers. He travelled to Lebanon then Turkey and Greece before finally landing in Germany where he's been since last October. During that journey he spent six hours in a boat where there were two children who reminded him of Alan Kurdi's then recent drowning. "I was thinking, what would happen if the parent died and the child survived," he told BBC Trending. "How would he continue his life?" In the weeks after Alan Kurdi's image went viral, there were several announcements of a policy shift in Western nations. Duvell says the US has not significantly increased its resettlement of Syrians, although President Barack Obama and the UN are shortly holding separate summits on the question. A number of southern and eastern European nations actually closed their borders to Syrians this year. Canada has taken over 25,000 Syrians, but by far the biggest shift was in Germany - which had already loosened its borders when Alan's image went viral, and where Syrians are still being given asylum. Half a million people are expected this year - although overall numbers are going down there too. 4. The verdict - did the Alan Kurdi picture change the world? When I asked academics and NGO workers to call it, they said yes - the viral image of Alan Kurdi bolstered interest, volunteering and campaigning. In other words, all that hashtag activism and debate has had some impact on the Syrian refugee issue. But Tima Kurdi, Alan's aunt, is now not so sure. A year later, many online are now sharing her comments - but her optimism about her family's tragedy being able to shift the debate has now ebbed away almost completely. "The sad part is it was only the first few months probably and then everybody went back to business," she told BBC Trending this week. "Since last year if you tell me there have been a lot of changes I would tell you it's getting worse it's not getting any better. It's about more people fleeing the war and people are still dying people are still crossing taking that journey in the water". "The only message that should be put out right now is to urge our world leaders to sit down on the table and talk - how can we end the war in Syria?" Pictures of children affected by Syria's war continue to go viral. The latest was two-year-old Omran Daqneesh - who survived a Russian bomb in Aleppo last month. And in the meme below his debris-covered image was combined with the iconic image of Alan Kurdi to highlight the plight of a whole generation of Syrian children who have known nothing but war. Tima Kurdi now feels these individual images, and the emotion they inspire, can almost distract the world from seeking a sober plan to end the underlying Syrian conflict. "The image of Omran... it's a powerful image, a heartbreaking image," she says. "That boy was Syrian's silence". "But she adds that "it's the wrong message because the message should be end the war in Syria". "Every day thousands of children are dying," she says. "But the media can only take one picture".